Today we will begin several reactions. Information will appear in this post and in class. Be sure you keep complete records in your notes. A. Label the bottle appropriately in the manner pictured. B. Take a wad of steel wool and stretch it longways. Shape it so that it is about 12 cm long and 2 cm wide. Make sure the steel wool is moist. C. Put the moistened steel wool into the bottle. Close the lid. Dry the outside completely. Find and record the starting mass. D. What do you think will happen to the steel wool? Why? What do you think will happen to the air? Why? What do you think will happen to the mass? Why? B. Take a similar amount of steel wool as in the previous experiment and ball it up. C. Put the ball of steel wool into the bottle. Put in enough vinegar to cover the ball. Close the lid tightly. Dry off the outside completely. Find and record the starting mass. Note the date and time. D. What do you think will happen to the steel wool? Why? What do you think will happen to the air? Why? 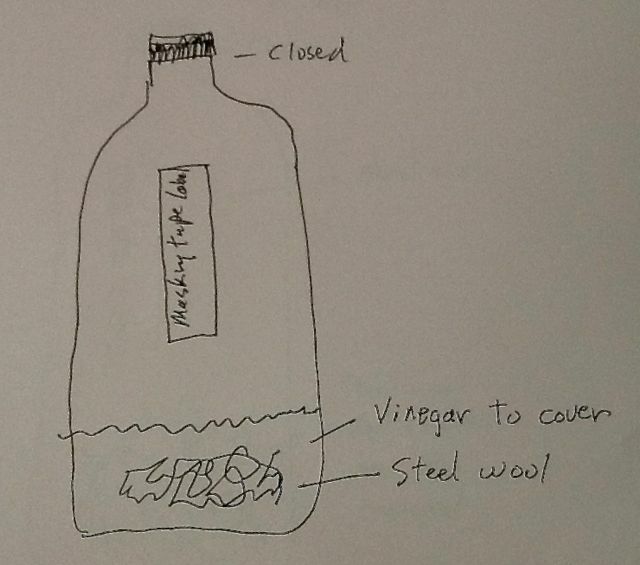 What do you think will happen to the vinegar? Why? What do you think will happen to the mass? Why? C. Close the lid tightly. Dry off the outside completely. Find and record the starting mass. Note the date and time. D. What do you think will happen to the mung beans? Why? What do you think will happen to the air? Why? 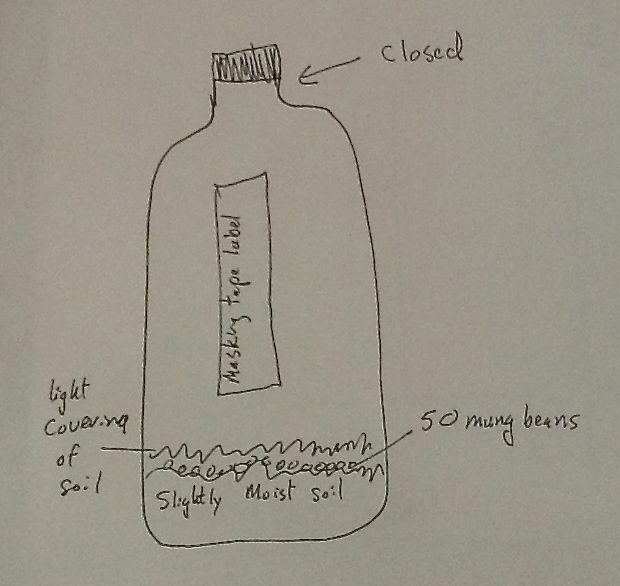 What do you think will happen to the soil? Why? 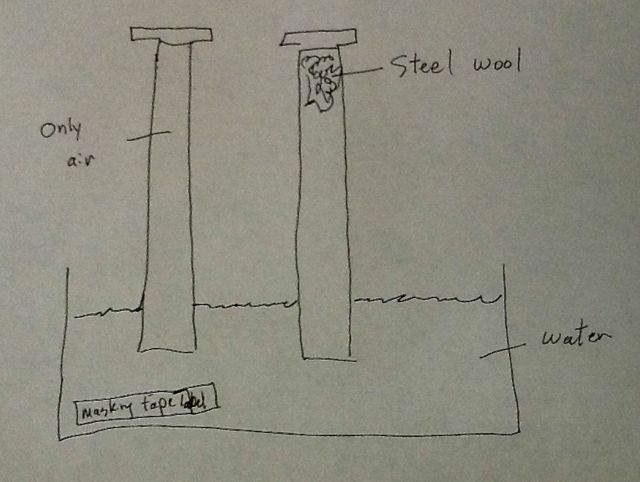 What do you think will happen to the water? Why? What do you think will happen to the mass? Why? 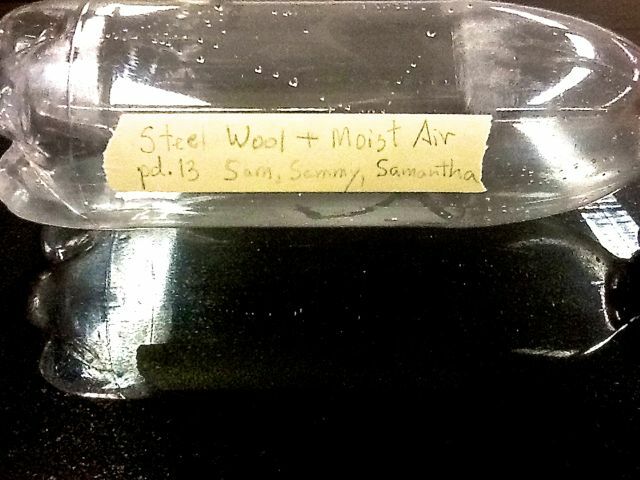 Experiment with steel wool and moist air in an inverted graduated cylinder. A. Take a small wad of steel wool and stuff it in the bottom of a graduated cylinder. B. Turn the cylinder with the steel wool upside down and put the mouth into a water-filled basin. Make sure the mouth of the cylinder is under the surface of the water. Pull out some of the air with a syringe and plastic tube until the water level sits at 100 ml. C. Take a 2nd cylinder without steel wool and set up in exactly the same way. Label the basin. D. What do you think will happen to the steel wool? Why? What do you think will happen to the air in the cylinder with the steel wool? Why? 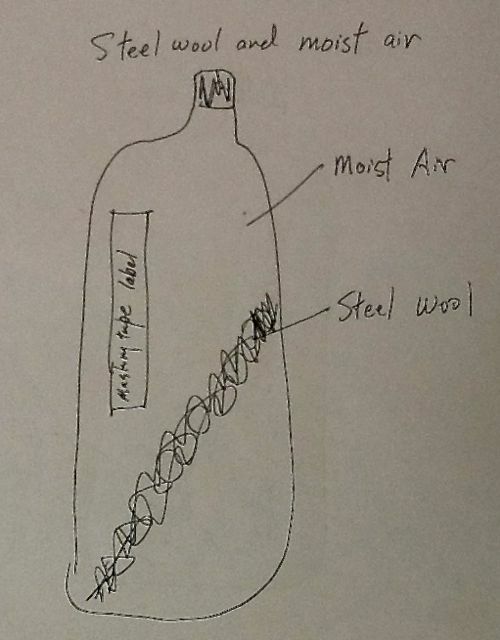 What do you think will happen to the air in the cylinder without steel wool? Why? A. Get a microscope slide and a microscope. B. Take a small piece of copper and put it on the slide. Get the piece of copper in focus. C. Add a drop of Silver Nitrate solution. D. Observe. Describe in words. Make a sketch carefully. Take a picture. IN A CHEMICAL REACTION, THE ATOMS THAT MAKE UP THE STARTING MATERIALS ARE REARRANGED INTO NEW MATERIALS WITH NEW PROPERTIES. IN A CHEMICAL REACTION, THE NUMBER AND KINDS OF STARTING ATOM REMAIN THE SAME FROM THE BEGINNING OF THE REACTION TO THE END. THIS CAN BE INFERRED THROUGH THE RESULTS OF BEFORE AND AFTER MASS MEASUREMENTS. Mass measurement must be conducted on a closed system where nothing escapes and nothing new is added.